I am periodically asked, "what is the best way to collect and analyze blood lactate data to determine functional threshold power?" Since applied research of this nature has never been my focus as an exercise physiologist, the most honest answer I can possibly give to such a question is, "I don't really know". I do, though, at least have an opinion, which is based on the relevant literature as well as my personal experience with lactate testing of cyclists. It is this opinion that I would like to share in this post. As many readers of this blog are undoubtly aware, there are multiple definitions or criteria used to establish "threshold" on the basis of lactate measurements, as well as multiple approachs to obtaining said data in the first place. The reason for this is that regardless of how the data are obtained or analyzed, all such thresholds tend to be highly correlated not only with endurance performance ability, physiological responses, etc., but also with one another, such that there is only a limited incentive in the scientific community for any form of standardization. In other words, from a purely research/conceptual perspective one method for determining lactate threshold (LT) is essentially just as good as any other, such that there isn't any great reason to favor any particular approach. On the other hand, when dealing directly with athletes some form of standardization is often quite helpful (e.g., so that a given individual's data are more "transportable"), especially when comparisons are to be made to some other reference measurement, e.g., functional threshold power. 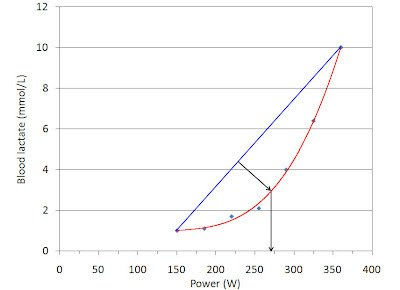 In the above figure, the blue diamonds are the actual lactate data, the red curve is the fitted polynomial, the blue line joins the lowest and highest points on this curve, and the black arrows illustrate how the Dmax point and associated power output are determined. 5) it yields a value for LT that appears to be quite close to functional threshold power. It is primarily these last two points that I will focus on in the rest of this article. One of the motivations behind the original development of the Dmax method is the fact that when studying athletes who are actively training for competition, it can be difficult to standardize testing conditions as carefully as desirable. For example, on one occasion an athlete may be tested towards the end of a recovery week, when their muscle glycogen stores are high, whereas on another they may be tested at the end of a heavy block of training or at a training camp, when their muscle glycogen stores are low. Since large differences in muscle glycogen concentration will influence blood lactate levels, this can lead to under- or overestimation of an athlete's "true" LT if the latter is defined based on a fixed blood lactate concentration. Similarly, endurance training itself, via an increase in muscle respiratory capacity and a suppression of glycolytic enzyme activities, especially lactate dehydrogenase, tends to alter the vertical position of the blood lactate-exercise intensity curve, as well as shift it left or right. Again, this can create problems when using a fixed blood lactate concentration to define LT, as the individual's actual performance ability may not increase or decrease as much as implied by changes in their blood lactate threshold. Figure 2. 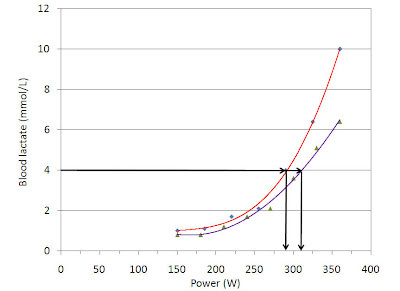 Determination of power output corresponding to OBLA using data from the 1st test shown in Figure 1 along with data from a 2nd test performed approximately 2 mo later. In this plot, the blue diamonds and red curve are the same as in Figure 1, whereas the olive triangles and purple curve show the results of a follow-up test from the same athlete performed approximately 2 mo later. As can be seen in the figure, on the 2nd occasions their lactate concentration-exercise intensity curve was not only shifted to the left, but was also shifted quite a bit downward, especially at higher exercise intensities. Without additional information, it cannot be determined whether this is due to differences in exercise patterns and/or dietary carbohydrate intake on the days preceeding each test, a true training effect, or perhaps a difference in the calibration and hence accuracy of the lactate analyzer(s) that was/were employed. Clearly, however, the difference between the two tests in the location of curve with respect to the X and Y axes would influence the calculated magnitude of the difference in "threshold" when the latter is calculated using a fixed blood lactate concentration. For example, as shown by the heavy black arrows this athlete's OBLA seemingly increased from 290 W at the time of the 1st test to 308 W at the time of the 2nd test. At least some of this apparent improvement, however, seems likely to be related to the significant difference in absolute blood lactate levels, as there were no differences between the two tests (which were performed in the late fall and early winter, respectively) in either their heart rate-power output relationship or the power at which they ultimately fatigued during the incremental exercise tests. That the change in their OBLA likely overestimates the true increase in their functional threshold power is also suggested by the fact that it falls outside of the 72-77% of the final power ("MAP") normally found, especially during the 2nd test (i.e., 308 W / 360 W x 100% = 86%). Converse to the above, when LT is defined using the Dmax method, thus taking into account the large differences in absolute blood lactate concentration, the results indicate that the athlete's LT changed minimally between tests, being 271 W on the 1st occasion and 263 W on the 2nd occasion (analysis not shown). This result is in keeping with the fact that there were no significant changes in their heart rate-power output relationship (data not shown), or in the maximal power they achieved during each test. Finally, these results are consistent with their MAP of 360 W on each occasion (i.e., 271 W / 360 W x 100% = 75%, 263 W / 360 W x 100% = 73%). Thus, although I lack any other information on this individual and thus can't state with certainty, based on their test results I would predict that there were minimal changes in their endurance performance ability between the two tests. As stated before, in scientific studies a high correlation has almost invariably been found between various measures of LT and various measures of endurance performance ability, including the maximal power than a cyclist can maintain for 1 h (e.g., 2-4), which is what I have defined as "functional threshold power". A high correlation, however, is not the same as exact agreement - for example, when LT is defined as the exercise intensity corresponding to a 1 mmol/L increase in exercise baseline, the resultant value is highly correlated (i.e., R = 0.93) with "hour power", but the absolute values differ by, on average, 12% (range 4-19%) (4). This sort of offset or bias can be confusing to athletes using powermeters, and can complicate the prescription of training levels or zones based on laboratory-type testing. 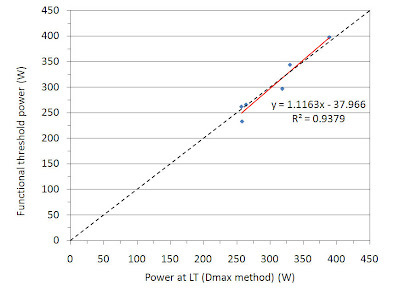 Thus, in an ideal world you would want to define LT in such a manner that it is not only highly correlated with functional threshold power, but it is at least on average the same as functional threshold power. Taking into consideration all of the available data as well as simplicity or practicality of the testing, at least at the present time it appears to me that the Dmax method comes closest to satisfying this criteria. For example, in two separate studies of female cyclists and triathletes Bishop et al. found that, of the six methods they examined, not only was LT defined using the Dmax criteria most closely correlated with maximal 1 h power, the two differed, on average, by only 1% (2,3). (In contrast, power at OBLA was almost 10% higher, whereas other measures, such as LT defined as the breakpoint in the blood lactate-vs.-power curve when both are plotted on a log scale, were significantly lower.) Much more recently, Drs. Simon Jobson, now at the University of Kent, and Lindsay Edwards, now at the University of Tasmania, have obtained similar results (cf. Figure 3). Figure 3. 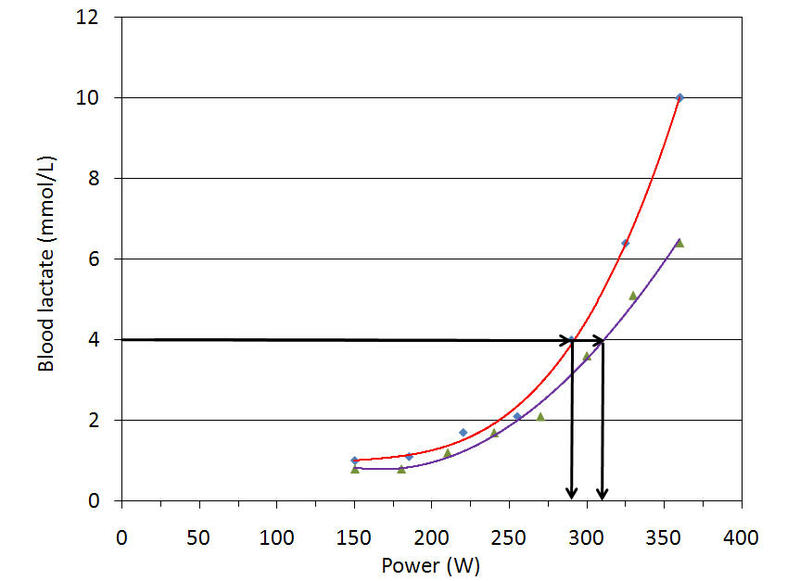 Relationship between functional threshold power and power at LT determined using the Dmax method in six male cyclists (Jobson and Edwards, unpublished observations). Once again, power LT as determined using the Dmax method and functional threshold power were within 1% of each other, averaging 303 +/ -53 W and 300 +/- 61 W, respectively. On the other hand, Van Schuylenbergh, Vanden Eynde, and Hespel (5) have concluded that the Dmax approach cannot be used to precisely predict the maximal steady-state power of professional cyclists. In this study, however, maximal steady-state power was determined using a 30 min instead of a 60 min test, which likely accounts for much of the 7% difference in the mean values. Moreover, as found by others there was a good correlation (i.e., R=0.85) between 30 min power and power at LT as defined using the Dmax approach when the stages of the incremental exercise test were 6 min long. However, no correlation was found when the stages were only 30 s in length, presumably because insufficient time was allowed for diffusion of lactate from the exercising muscles into the blood. On the other hand, McNaughton, Roberts, and Bentley (6) found no difference in LT determined using the Dmax method when comparing incremental exercise tests using 3 min vs. 5 min steps, implying that a minimum of 3 min should be used. This blog entry is not intended to be a "how to" guide to lactate testing, as it is impossible to cover the numerous details (e.g., blood sampling site, measurement of blood vs. plasma lactate, etc.) potentially impacting the results. As well, I do not mean to imply that the Dmax method is markedly superior to other approachs, and that indviduals currently conducting lactate testing should change their methodology (there is quite a bit to be said for sticking to a consistent protocol and establishing a database of knowledge from which to draw, even if newer/ostensibly better methods happen to come along). Rather, my goal here has simply been to draw people's attention to this alternative in case they wish to try it themselves, as well as to highlight some of the considerations and complications associated with the use of lactate data to, e.g, prescribe training intensities. 1. Cheng B, Kuipers H, Snyder AC, Keizer HA, Jeukendrup A, Hesselink M. A new approach for the determination of ventilatory and lactate thresholds.Int J Sports Med 13:518-522, 1992. 2. Bishop D, Jenkins DG, Mackinnon LT. The relationship between plasma lactate parameters, Wpeak and 1-h cycling performance in women. Med Sci Sports Exerc 30:1270-1275, 1998. 3. Bishop D, Jenkins DG, McEniery M, Carey MF. Relationship between plasma lactate parameters and muscle characteristics in female cyclists. Med Sci Sports Exerc 32:1088-1093, 2000. 4. Coyle EF, Feltner ME, Kautz SA, Hamilton MT, Montain SJ, Baylor AM, Abraham LD, Petrek GW. Physiological and biomechanical factors associated with elite endurance cycling performance. Med Sci Sports Exerc 23:93-107, 1991. 5. Van Schuylenbergh R, Vanden Eynde B, and Hespel P. Correlations between lactate and ventilatory thresholds and maximal lactate steady state in elite cyclists. Int J Sports Med 25:403-408, 2004. 6. McNaughton LR, Roberts S, Bentley DJ. The relationship among peak power output, lactate threshold, and short-distance cycling performance: effect of incremental exercise test design. J Strength Cond Res 20:157-161, 2006. Fascinating article. Do you know if anyone has studied the correlation between % muscle fibre type and lactate concentration at functional threshold power? Eg, would having different % of fast twitch vs slow twitch fibres account for the discrepancy in correlation between LT and FTP?